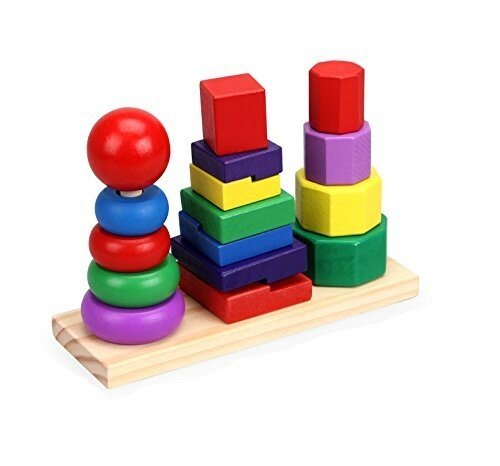 Wooden colorful stack blocks with 4 column,baby toys for age from 3 years to 6 years. Wooden with Food-grade water-based paint,it has 17-pieces woods,and 6 colors in 5 irregular shapes. This education toy can develop your baby's practical ability,exercise finger dexterity.develop your baby's creativity and the ability of concentrate on learning. Wooden colorful stack blocks with 4 column,baby toys for age from 3 years to 6 years. Wooden with Food-grade water-based paint,it has 17-pieces woods,and 6 colors in 5 irregular shapes. Paper boxed for easy cleanup.Educational Toys,Exceptional quality and value Made in china.As it has many small part,so not for children under 3 years.can not eat This education toy can develop your baby's practical ability,exercise finger dexterity.develop your baby's creativity and the ability of concentrate on learning.